I will now present the same table of available models seen before, but this time ordered by EIN, which is a measure of the unit's input noise, A-weighted so it follows the response curve of our ear. (These numbers are negative but I present the absolute value for convenience.) The higher this number, the less noise the pre-amp introduces into the signal. The final column indicates the self-noise of the quietest microphone this recorder supports, assuming the microphone has 20 mV/Pa sensitivity. The justification behind this is simple: there is no point having a low noise recorder if you are going to pair it to a noisy mic. The recorders have then been categorised into three "quality" categories, based on how quietly you can record with them, assuming an excellent microphone. Let me explain in more detail how these numbers were derived, making clear the assumptions. First, we must somehow relate the self-noise of the microphone to the pre-amp noise of the recorder it is to be coupled with. According to Rob Danielson, who has done extensive work in this area, "the mic pre number needs to be 7-10 dBu less to be inaudible 'behind' the self-noise of the mics used"1. Thus, all else being equal, we can use a microphone that is noisier than the recorder by, say, 8dB. Assuming a constant microphone sensitivity, I looked up the corresponding microphone self-noise figure, using the method outlined by Dennis Bohn of Rane Corporation in the article Selecting Mic Preamps 2. If you are using a microphone with sensitivity that diverges from 20 mV/Pa, you may wish to make your own calculations. But realise that the Rane table is only an approximation. If you have a microphone with greater sensitivity, you can lower the gain on your recorder to get the same resulting signal amplitude. Thus the gain structure of the recorder -- how the noise changes with amplification -- affects the result. It is also true that not all noise is created (or measured) equally; it depends on bandwidth. Even if the noise figures are A-weighted to correspond to the average human hearing frequency curve, this is only an idealised approximation; your ears are different than mine. Not only that, but how the frequency of the noise of the recorder and the microphone correspond is unquantified by any of these measurements. Which frequencies have greater amplitude dictate how the recorder noise will be masked by the mic noise. Our estimate of 8dB might be far off for some frequencies. In the meantime there is a good deal of expertise to be found at the Nature Recordists Yahoo Group. Real-world results using various combinations of microphones and recorders are reported there. So, which recorders can I provisionally recommend? Unless you want to carry around an extra phantom power supply3, your best mics are well served by a recorder with XLR and phantom power built in. 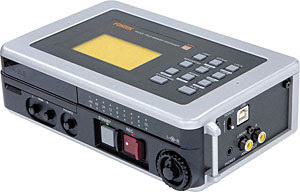 Assuming you have the quietest mic you can get, the Sound Devices 702, Fostex FR-2LE and Tascam HD-P2 are the recommended recorders. Of course there are many other high-end devices if you have even more money -- my original list was selected with price in mind. Thus further options from Sound Devices, Nagra, etc. exist if you have the funds. I made my own purchase decision by looking at the spec for my Audio-Technica 3032 mics (small diameter omni condensers). These are rated by the manufacturer at 16dB self-noise but have been tested as low as 8dB -- truly incredible!4 Their EIN works out to -118dBu(A). With this in mind I went shopping and found a great deal on a second-hand Fostex FR-2LE. This combination can truly make some amazing recordings! I hope that you can use the information presented here to make a similarly satisfying decision. 1 This comes from a highly-informative page at Rob Danielson's site. 3 The next article will provide an overview of such options. 4 So much so that Audio-Technica discontinued them. To get similar performance you now pay much more. I have updated this article to make the various assumptions and compromises more apparent. The table has also been simplified so that the focus is not so much on the numerical figures. Where does the Sony PCM-M10 fall in your chart? The PCM-M10 has been added -- sorry for the omission. Nagra my friend, where is Nagra? You missed the best portable recorders around..read again! If you read the articles from the start you will see that I restricted consideration to affordable recorders, but included the Sound Devices 702 as a higher-price model for comparison purposes. Nagra are generally priced at $3000-8000 though they have a few hand-held units under a grand. Seriously nice reasearch and reporting! For someone like myself who cannot afford to do this himself, your 3-part series is a real life-saver. Please consider including the combination of our Mic2496 V2 portable dual mic pre/ADC/phantom supply and the M-Audio MicroTrack II (or any other recorder with an S/PDIF input). You'll find that it rivals the 702/722 in performance at roughly half the price. Thanks Len for your comments. Certainly an external DACs, mic pre-amp or battery pack can make up for any shortcomings in the recorder itself. However those combinations were outside the scope of what I could easily cover here. I personally prefer not to have to managing the extra cabling, weight, size, etc... although I realise none of these are insurmountable problems. I wish I'd read this excellent article a week before - so I'd bought Marantz 661 instead of the Tascam dr-100 mkII. The prices were almost the same! Anyway this Tascam isn't bad at all, the GUI is simply great. But the sound quality (which indeed matters) is better at the Marantz, as far as I see here. Thanks for your research, anyway!